Swap Meet Booths are 10' x 10' space. Contact Jack @ 719-269-1721. Download the Entry Form. 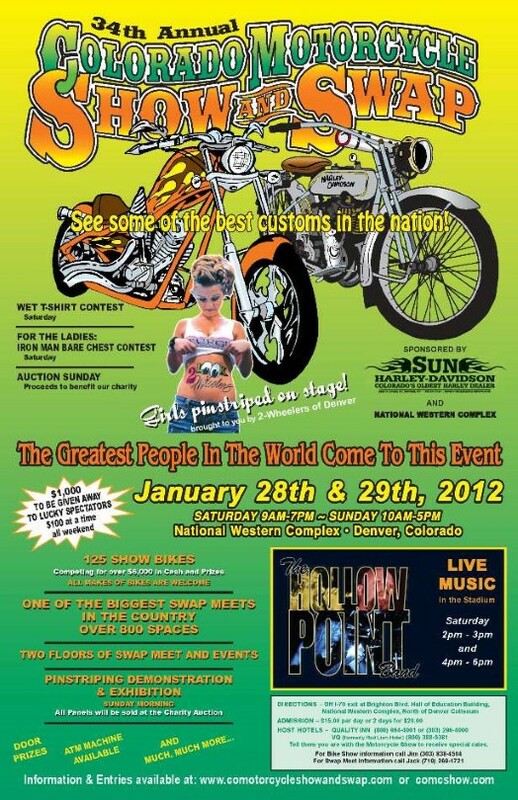 Motorcycle Show entries $40 per bike. Contact Jim @ 303-838-4504. Download the Entry Form. Pinstriping Exhibition - Some of the country's top pinstripers will be competing. Live Music - Saturday 2-3 p.m. and 4-6 p.m. The Hollow Point Band 125 Show Bikes - Competing for over $6,000 in Cash & Prizes. Over 800 Swap Meet Booths - Vendors from across the United States. Watch this website for more information. Wet T-shirt Contest - Saturday only. Ironman Bare Chest Contest (The Ladies LOVE This One!) - Saturday only.